Police have released the name of a man who died while taking part in the Great Scottish Run in Glasgow on Sunday. Aubrey Smith, from Glasgow, was seen falling to the ground in the city's Ballater Street just after 13:00. The 28-year-old died a short time later at Glasgow Royal Infirmary. A post-mortem examination will be held to determine how he died. 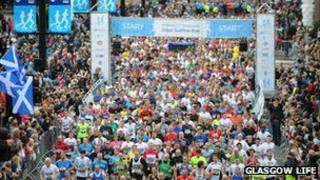 Thousands of runners covered the 13 mile route which started in the city centre and finished at Glasgow Green.